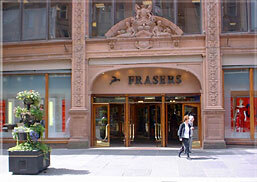 Glasgow is the largest and best retail centre in the UK outside of London. 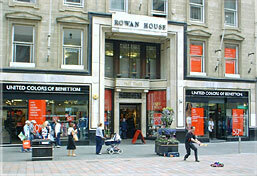 The vibrant shopping district in the heart of the city is focused around the pedestrianised areas of Buchanan Street, Argyle Street, and Sauchiehall Street. 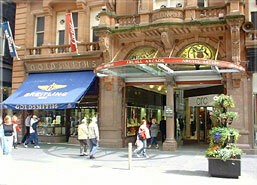 Argyll Arcade, one of Britain's oldest covered shopping arcades, built in 1827, is home to 32 jewellery shops, while the Buchanan Galleries is one of the UK's largest city centre retail projects. Other highlights include the refurbished St Enoch Centre, the Designer Exchange off Royal Exchange Square, and Princes Square set in a renovated 1841 square has a cosmopolitan selection of designer names. 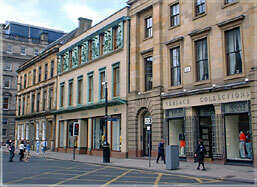 The Merchant City area (recalling the entrepreneurial adventurers who traded with the Americas in the 17th and 18th centuries) and the West End have a wealth of unique bookshops, antique stores and second-hand clothing emporia. The Barras - the open-air street market between Gallowgate and London Road in the East End - is open for business at the weekend (0900-1600), for the sale of antiques, bric-�-brac, clothing and food. Popular 'traditional' purchases include woollens, tartan scarves and kilts, Celtic jewellery, golfing equipment and, of course, whisky. In addition there's the Italian Centre which combines Italian designer excellence with stylish cafes and restaurants, and for an offbeat shopping experience there's De Courcy's Antique Craft Arcade located in the West End and the Victorian Village is a great browsing ground for costume jewellery and memorabilia hunters. In general, shops are open Monday to Saturday 0900-1730/1800. Many shops are open later on Thursday and most of the larger chain stores are open on Sunday. A Value Added Tax (VAT) of 17.5% is included in the price of many goods. Under the Retail Export Scheme, overseas visitors can obtain tax relief on goods if leaving the UK for destinations outside the EU. A form should be obtained at the time of purchase and submitted to the customs authority at the point of departure.